Eight sections (with one cancelled) over two days for a feast of bends and excitement with 107 cars in the modern event and 170 in the historical event. This was the 34th Bassano Rally, for which Syncro System joined the list of sponsors. First place was secured by the favourite Eddie Sciessere, winner of last year’s edition, partnered this time by Flavio Zanella. 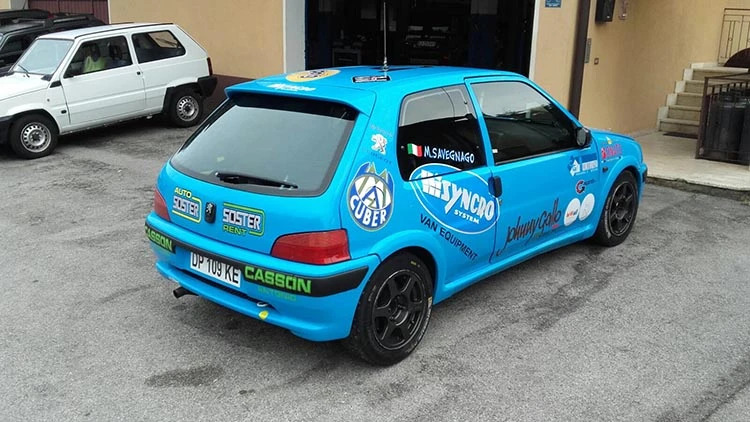 The grey-blue Syncro System logo was seen for the full 400 km of the route on the “smurf blue” Peugeot driven by Michele Crescenzo with navigator Mauro Savegnago, both from Vicenza. "Fantastic!" -declared Michele Crescenzo, a few hours after crossing the finish line of the last special section. "The Bassano Rally is my home rally, and completing this 34th edition was just as good as finishing the world championship for me. A tremendous feeling!". This year’s event provided rally enthusiasts with plenty of excitement, especially with the unexpected cancellation of the last Campo Croce special section. The race proved a tough challenge for all teams, with a sequence of high-adrenaline sections along the twisting roads of Foza and Rubbio before moving on to Monte Grappa and the Campo Croce and San Giovanni sections. Crescenzo and Savegnago’s “smurf blue” Peugeot 206 16V performed extremely well. "We tried to prepare the car as well as we could, down to the very last details. The race was incredibly tough and technical! Completing each special section was a miracle in itself because of all the surprises encountered along the route," Crescenzo posted on Facebook. "The car was a real missile, a genuine competition 106, great to look at and very well prepared too. I’m delighted and proud to have driven it for the full 400 kilometres".